The American Academy of Pediatric Dentistry recommends taking your child to the dentist as soon as his or her first tooth appears, or no later than the first birthday. To some parents, this may seem early for an appointment, but it’s a reflection of how important children’s dental health really is. Poor dental health can result in other health issues, for both adults and children. That’s why it’s so important for parents to model good dental health habits and instill those in their kids from a young age. With February being National Children’s Dental Health Month, now is a perfect time to reflect on what kids can do to build strong and healthy teeth. Below we’re providing some tips that can help kids understand the importance of a healthy mouth and things that they can do every day toward that goal. Tooth decay is a serious threat to children’s dental health. Starting even the youngest children out using a fluoride toothpaste is the best and strongest defense against this issue. Fluoride toothpaste is also better for fighting cavities, which is great for kids to be aware of from a young age. Start with a small dollop of toothpaste at first and scale up the amount as kids get older. Kids are extremely observant and they often learn by imitating what they see their parents doing. If you want your children to have good dental hygiene, it’s important that you lead by example. As often as you can, brush your teeth with or in front of your child. Show them the technique you use, how your toothbrush is just like theirs, and other similarities that will get them excited. The more fun it seems like you’re having, the more positive the association will be for your children. 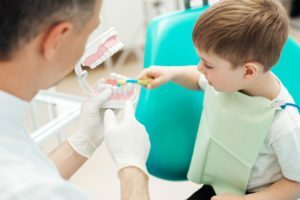 Keeping up with regular dentist appointments is a key component to maintaining your child’s dental health, but most children grow up dreading dentist visits. Try to make going to the dentist a positive experience for your child. Providing a small reward for a good attitude or positive behavior can help make children more open to dentist’s visits. Very young children may not be able to understand the health benefits of a dentist visit, but as soon as your child is old enough, try to make that connection. Children are often taught the importance of healthy habits, like eating right and exercising. Teach them that going to the dentist is part of a healthy lifestyle as well. Ready to Celebrate National Children’s Dental Health Month? February is a great time to focus on your child’s dental health, but good dental hygiene should be a part of their everyday life. Over the next month, start implementing some of these ideas. You’ll be building the foundation for your child’s health for the rest of their life. For more information about improving and maintaining your child’s dental hygiene, please contact us.